For the last rendition of the Venice Biennale there were 89 countries represented total and the curator Bice Curiger’s theme was “Illuminations”. While each pavilion had its own methods of choosing artists, the curator did pose this lofty notion of illumination, of spirituality to her choice of work in the main gallery and exhibition centers. There is no question there are major trends in contemporary art now that veer into the waters of spirituality – less the angels and monsters way, but more of a subtle spirituality and more about consciousness. With this trend of spirituality and “illumination” in the air, its no wonder the Holy See wanted a part in the action, a place in the sun, a part of the pie. It was only after reading about their inclusion among eight new nations that I realized the Holy See actually existed. The Holy See, is the sovereign nation of the Vatican if you will. I’ve just started a wikipedia dive that is so deep I am dizzy reading about sovereignty, Kritarchy and feudal aristocracy – all sparked by this new term “Holy See” and what it actually means, and why on earth does the Vatican have a pavilion? And what in God’s name will they be placing in it from a contemporary art perspective. Hmmmm. The other nations new to the VB this year are the Bahamas, the Kingdom of Bahrain, the Republic of Kosovo, Kuwait, the Maldives, Côte d’Ivoire (! ), Nigeria and Paraguay. It seems the new curator for the VB, Massimiliano Gioni, has a theme of “Encyclopedic Palace” for his exhibit he will design at the Palazzo delle Esposizioni and the Arsenale. If he’s jumping on the boat that curator Carolyn Christov-Bakargiev was on for the 13th documenta, then I believe we will be in for a real treat. The overarching theme of the documenta was “collapse and recovery”. The result was a mindful combination of interests – art, science, history, archaeology and politics, in a contemporary curator’s borrowed wonderkammer. I’ll envision Gioni’s choices as a collection of goodies from seemingly disparate places, all under the guise of encyclopedia to keep the sense of reality in tact. I hope that his choices are unconventional and refreshing. And in case you are new to the Biennial circuit and get to go this coming year, please step off the track often and most definitely visit the Museo Fortuny – previous home of one of Italy’s most original artists and collectors, Mariano Fortuny. The building houses his original collections, and during the recent biennials have been host to marvelous redesign and mixing of his objects with contemporary art. It’s magnificent truly! 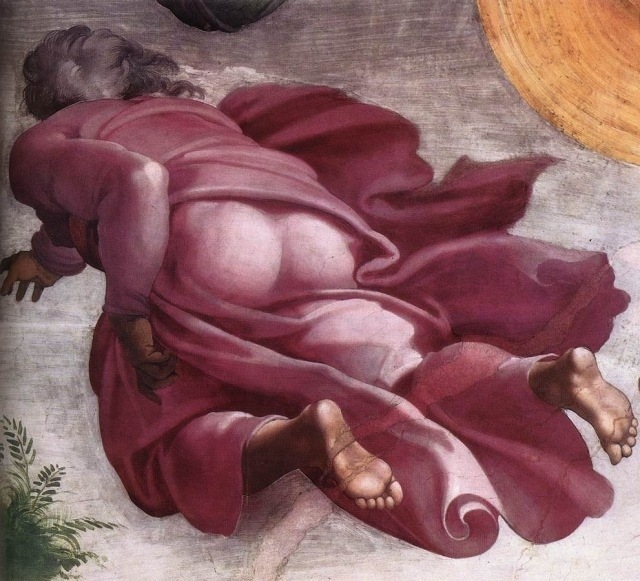 Detail of God\’s backside from the Creation of Plants by Michelangelo (1511), Sistine Chapel ceiling.